Think all fairy tales end with a happily-ever-after? Well, you probably never saw the twisted original incarnations of your favorite stories. WARNING: Your childhood is about to get ruined! “The Little Mermaid”: Differing significantly from the 1989 Disney film, Hans Christian Andersen’s original story portrayed the Little Mermaid as a fish with an arm coming out of its back. Instead of struggling with the challenges of living as a human underwater, the original Little Mermaid simply spends the majority of the story flailing wildly and punching scuba divers. “The Adventures Of Pinocchio”: In the first version of this tale, Pinocchio is a disfigured boy made of sopping wet cardboard, and every time he tells a lie, he grows another ghastly soaked cardboard appendage until Geppetto throws him away. “Beauty And The Beast”: In the original (and highly insensitive) telling of this romantic tale, the thing that supposedly makes the Beast a beast is the fact that he has dyslexia. 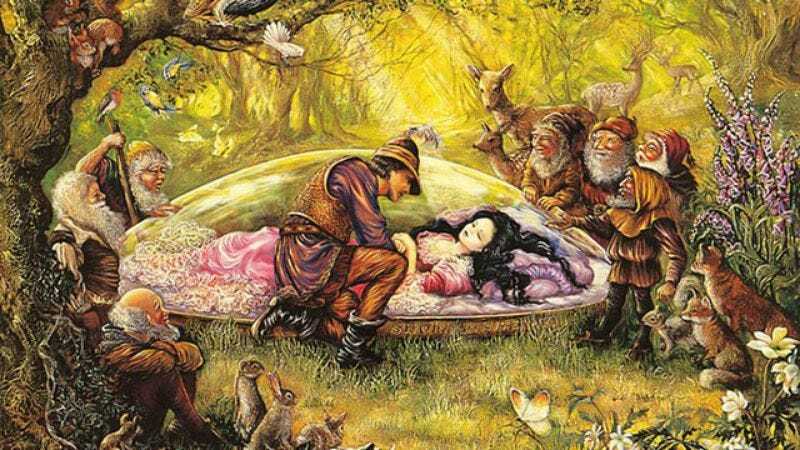 “Snow White”: While Walt Disney popularized a more marketable version of this fairy tale, in its original form the seven dwarves were named Lucifer, Lucifer’s Nephew, Yelling Girl, Basket Lad, Sin Machine, Loose Pepper, and Bank Robber. The dwarves work as guards at a prison for people in the kingdom who have said too many swear words, and it is strongly implied that they are secretly killing and eating their prisoners. “The Frog Prince”: The original plot of “The Frog Prince” remains largely untouched, except for one glaring omission: After the frog transformed into a handsome prince, he remained sexually attracted to frogs. Even after taking the throne, he had constant, voracious longings for an amphibian’s touch. “The Gingerbread Man”: While the first iteration of this story actually remains fairly consistent with the current one, the last line of the tale, “Hell is real, and I have seen it. Good Christ, have I seen it,” was eventually cut for unknown reasons.